This guy’s story really did have a happy ending. If you continue driving when your engine’s overheating, you risk a catastrophic engine failure. It really is a good idea to pull over and let your auto engine cool down before driving again. If you add water or coolant, be sure your engine is cool or you risk serious burns. 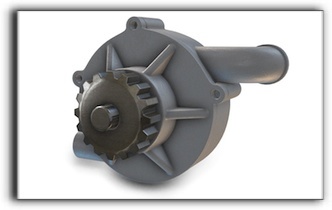 Now there’s no way to predict when a water pump will fail – they just wear out. This water pump replacement was more expensive because his water pump is driven by his timing belt. That requires a lot of hours to get to the water pump and then put everything back on the engine. Here’s a money saving tip: if your water pump is driven by your timing belt – replace the pump when you have your scheduled timing belt replacement. That way most of the work is already done and you don’t have to pay for it twice. Stop by and ask us when your timing belt should be replaced. Today’s Pro Muffler & Brake Shop Inc article focuses on your serpentine belt. Your serpentine belt is a long belt that’s driven by your engine. It winds around several accessories that power important automotive systems. Let’s go over them. The serpentine belt may also run the pumps for both the power steering and power brakes. In some minivans, power steering may have an electric drive and power brakes can be vacuum driven. Your Pro Muffler & Brake Shop Inc service technician can perform a visual inspection of the belt to see if it has any cracks that signal the belt could fail soon and will measure the amount of belt material to make sure there is enough. All in all, the serpentine belt’s an important part for the function of your minivan. And it’s not that expensive to replace at Pro Muffler & Brake Shop Inc – so it’s good to do so before it fails. At Pro Muffler & Brake Shop Inc we install quality NAPA replacement parts. Give us a call at 269.926.2006.